Winter can be a tough time for gardeners because for the most part fall and spring are a gardeners play time. However, winter is not to be left out as this is also a great time to plant trees. Deciduous, evergreen and fruiting alike. If you are buying plants in their dormant stage, it is important that you choose your trees from a reputable source who guarantees the tree for at least one season to ensure that the tree is sound. Choose fruit varieties that meet our freeze requirements and remember to plant fruit trees in pairs when necessary. 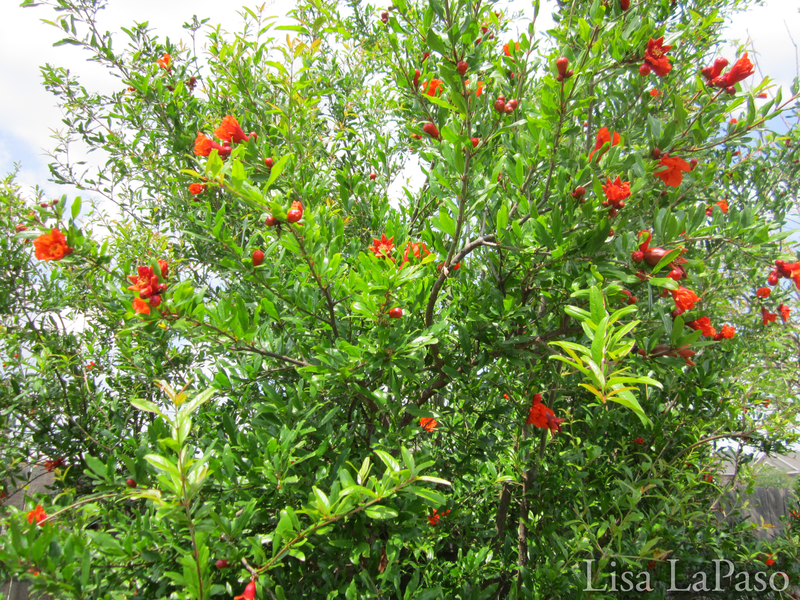 I think you will also be pleasantly surprised by how many fruit trees do beautifully in Central Texas. While you need to be careful about the variety and cultivars you choose because of our limited chill hours, you can find a number of great choices and varieties of Peaches, Plums, Pears, Apples, Pomegranates, Loquats, Figs, Persimmons and even kumquats, Lemons, limes and Oranges (on a protected side of your home.) Here is a list of some of my favorite trees to consider that will not be the same ol’ ,same ol’ click here ***If you choose an ornamental berrying variety of tree, buy it with the berries on it otherwise, you may end up with a non fruiting male. “Wonderful” Pomegranate, beautiful color in spring followed by huge fruit in the fall. Low water, low to no maintenance. Always use native and adaptive trees and plants. Plants introduced from other areas or countries have no checks and balances here so they can become invasive and wreak havoc on our ecosystem as well as introduce diseases to our area. An additional benefit to planting native flowering trees is that they feed our native bees. When planting your trees be sure to use the proper tools. Only dig the hole a little deeper as the pot the tree came in, but make the hole twice as wide. Fill the excess space with some rich organic matter (compost) and mulch the base of the tree with several inches of mulch to create a well, or berm around the root ball leaving the top of the root ball exposed. This allows the tree to catch and hold additional water in this well until the tree becomes acclimated and established. Stake the tree to insure it is not injured by wind. Once a tree is about 2-3 years old, remove the stakes and ties and keep a flat mulch ring for aesthetic and feeding purposes only, your mature tree no longer needs a berm as its roots are far beyond that space and a mature tree needs water at its “drip line” which is the very end of its branches, not the trunk. I prefer to avoid jack hammering a hole for your tree, you may be putting it into a concrete tomb where there will be no room for roots or water to drain. Find a spot where your tree can have a fighting chance and if all else fails, build up the area. It is always better to have the root ball a little too high out of the ground and covered with mulch, than to have it be buried beneath the surface where it may get waterlogged in heavy rains. 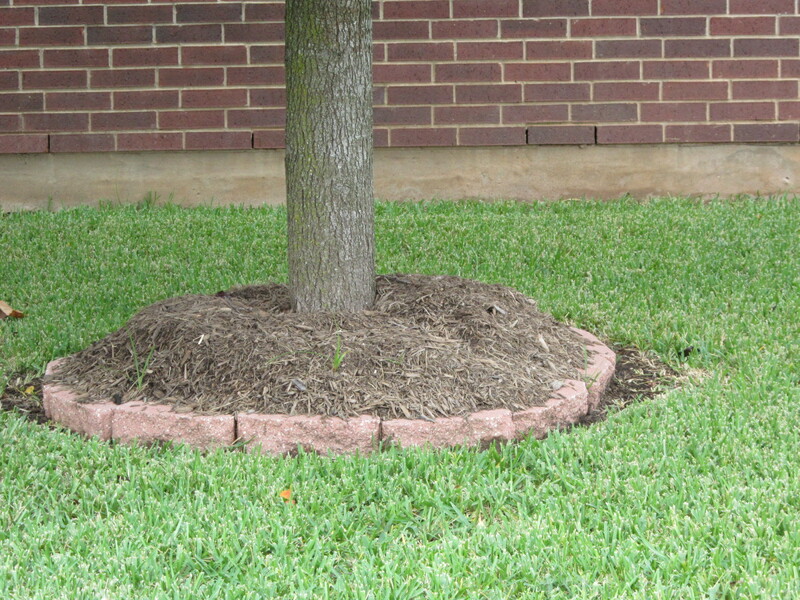 Badly mulched tree, this should have a well around the tree with tree “Flair” or bell shape visible in the center of the berm. Your tree should never look like a stick coming out of a pile. When planting your tree I suggest you use a liquid root stimulator or activator product and use as suggested. This product can be purchased at most nurseries and big box stores. Do not feed your trees over the Winter as they are in a dormant state and we do not want to encourage them to bloom or leaf out prematurely. When it is time to fertilize in the Spring, ALWAYS use organic fertilizers as they feed the soil and the plants, and NEVER use “Weed and Feed” products near your trees. (or at all for that matter) Aside from the fact that the timing is off on these products (you weed prevent in late Winter and fertilize in early Spring, not at the same time) but these products recognize everything living as a weed and not only destroy the ECO systems, but also kill your trees. I have visited countless houses with “Burn” damage to their trees from Weed and Feed. My usual practice it to add a ring of compost to my trees each Spring to fertilize throughout the season. You can add residual fertilizers like Liquid Seaweed every couple of weeks or as desired. Watering depends a lot on the size of your tree but a general rule of thumb is to water every day for the first two weeks with a hand held hose or soaker hose to maintain moisture (not soaking) enough to establish the roots, then taper off to every other day and three days and so on until you are only watering once a week as needed. Irrigation will not suffice unless you have a dedicated soaker or drip on the tree. A tree drip will only be good for the tree for the first year or so because once the tree roots go beyond the mulch ring it will no longer be effective. Once the tree is established (the first year or so) you no longer need to water all the time. The tree will let you know when it is thirsty by showing signs of stress such as limp leaves or loss. If the ground is dry and you have been without rain then you can always loop a drip or soaker hose around the drip line (The ends of the branches, like stretching your arms out to the fingertips) and soak the ground for an hour or so every few days or so until it is happy again. AGAIN< be sure not to overwater, that is far more damaging then under watering. If you have a mature tree (3 or more years) you shouldn’t need to water a native or adapted tree unless we are in without rain for extended periods of time. Finally, always be sure to check your tree stake after installation and carefully monitor the tie around the limb to avoid injury to the tree. Never use wire directly on the trunk or limb, use a part of an old hose or rubber tube over the wire to cover the area that touches the tree trunk or limb. After about the second year tree stakes are no longer necessary and should be removed. Leaving the ties on the tree too tightly can create girdling damage and/or death to the tree. Take pictures each year by your tree. You will be amazed by how quickly they grow and add value to your life and your property. if you are in the Austin or surrounding area and would like a landscape consultation to talk about your landscape needs, plant selection or general care, email me at lisalapaso@ Gmail.com. Check out my videos on YouTube!! I was sent this article in my neighborhood newsletter. I added it to my blog, what do you think? True? Not True? Good info? Ryan, this is excellent information and very useful for anyone trying to get weeds under control without using chemicals. Thanks for the article!! When is the best time to prune a Crepe Myrtle? I have grass all in my backyard, I want to plant few trees wherever there is more soil and less rocks. How do I find out the spots where there are no rocks without damaging the grass ? Very nice blog post. I aabsolutely appreciate this site. Thank you for the heads up, I will check it out.